This was a very hotly contested derby between the 1st St Albans Impala and 1st St Albans Impeesa. For the second week running 1st Impala were involved in an end to end game, where the difference was the finishing with 1st Impeesa running out 7-0 winners. 1st Impala started the game slowly and Impeesa took full advantage of this with a couple of chances in the first couple of minutes. The first goal was an own goal, with the ball bouncing around the Impala box, Impala in trying to clear the ball diverted it in to their own net and nothing Joe Cox could do. This woke up Impala who responded really well with Jack Burke pulling the strings in midfield and James Cox marshalling the backline. Impala had a couple of chances through Ethan Roberts and Joshua Seeby which they were unable to convert and Impeesa scored there second from a counter attack with Nicholas Groves finding himself in a one on one and produced a cool finish. The third and forth goals came in quick succession with Ronan Brandon and Nicholas Groves scoring from close range. With the score 4-0 at half time Impala made a few changes with Joe Cox playing at left back and Nathan Seeby going in goal. Impala came out for the second half and played some very good football but could not find that elusive goal with chances falling to Liam Zammett who poked the ball inches wide of the Impeesa goal. Impeesa started to come back into the game and after some good football Nicholas Groves completed his hattrick when the ball slipped out of the goalkeeper’s hands and tapped the ball in for Impeesa fifth goal. Lucas Do had a good run and played a nice one two with Alfie Cromwell with Lucas crossing the ball which went straight through the box with Charlie James collecting and having a shot which just went wide. Impala kept pushing forward looking for there first goal which left spaces at the back which was exploited by Impeesa and Thomas Wilson scored for Impeesa to make it 6-0 with a good finish and then just before the end Ronan Brandon scored his second to make it 7-0. Man of the match for Impala was Jack Burke who played some really good football and was full of energy in the centre of midfield. Well done to both sets of players for a very good game and a more even match than the score line suggests. In what was an end to end game, the difference was the finishing with 17th ending 7-0 winners. 1st Impala started the game very well with Jack Burke finding space in centre midfield and playing in Nathan Seeby who put his shot wide. 17th then came back into the game and with a good finish from a tight angle went 1-0 up and nothing the Impala goalkeeper Joshua Seeby could do about it. Impala kept pushing forward and were finding some great spaces which they were unlucky not to exploit due to some great goalkeeping from the 17th goalkeeper. James Cox, Joe Cox and Jacob Butler were keeping the 17th from counter attacking as Impala pushed forward for an equaliser. With 5 mins left of the first half 17th scored two quick fire goals to go in at half time 3-0 up. The second half started much the same as the first half with Ethan Roberts of Impala making some great runs down the right-hand side and playing nice football with Lucas Do. Against the run of play 17th scored an excellent goal from long range which Joe Cox, this time in goal could do nothing about. In the space of a few minutes Impala had a few opportunities with Jack Burke and Joshua Seeby finding the 17th goalkeeper in inspired form making some excellent saves. Again, Jacob Butler was stopping the counter attacks when 17th were threatening. With 10 minutes left and Impala looking to get back into match 17th broke away and scored to make it 5-0 and then in quick succession 17th scored another couple of goals to make the score 7-0. Joe Cox made a few good saves including a couple of one on one’s with the defenders, James Cox and Lucas Do helping out with some last-ditch tackling. Impala did not give up looking for a goal even in the last seconds of the match the 17th goalkeeper made an amazing double save, first denying Ethan Roberts from close range and then Nathan Seeby with the rebound. The game ended 7-0 to 17th but does not reflect the chances Impala had but for some amazing goalkeeping from the 17th goalkeepers. Overall a more even match than the score line suggests. Well done to both teams. Congratulations to the Impeesa football team for winning the District 6-a-side football competition. Click here for the full report. As the new term is about to start, we invite Cubs from either our Impeesa or Impala packs to join our Cub Football team(s) under the management of their new manager – Daniel Seeby. He will be running an initial training session in Verulamiam Park, opposite the athletics track next to Westminster Lodge on Saturday 15th from 13.30 to 15.00. Just turn up and join in ! Lets have another good season ! Firstly thank you to everyone for your support yesterday on what was a very wet afternoon. I think most Cubs matches have been played in the rain this season! Secondly a huge thank you for the cards & gifts from the boys, parents and the Group for both Sarah and I. They are all very thoughtful and much appreciated. I still have my own Cub jumper somewhere in the loft so when I find it I can sew on the badge! Thirdly thank you to the Group for their support of the team both in person and providing kit etc which has been invaluable. It has been a pleasure to have been involved with Cub football for many years and I have met some fantastic young people and parents along the way. Cubs is very different from managing a youth football team as each year the team changes and so you always have new and different players wanting to take part. I wish all of you who are young enough to carry on playing next season the best of luck. I hope the boys are not too disappointed after yesterdays loss in the cup match. They should all be very proud of their performances and hopefully the trophy from winning the league will cheer them all up. As I said at the time to go the season undefeated is a huge achievement at any level and something they should remember and cherish. Sadly my notes from yesterday got very wet and were illegible when I sat down to write this. However, from memory the first half was a real battle with both teams struggling with the conditions and the slope. We took the lead through an excellent free kick by Jack and with some solid defending and good saves from Dylan managed to take a half time lead. As the second half progressed so did the dominance of the 2nd as they created more chances and we struggled to keep the ball and put them under enough pressure. An equaliser arrived early in the half but the winner was only a couple of minutes from the end which gave us little time to respond. In between Tom, Joshua and Jack tried to attack, but a few corners was the best we could show for our efforts. Ben had covered nearly every blade of grass but the defensive quartet of Ozan, Ronan, Callum and Sammy could not quite hold out to take the match to extra time. So the final whistle was met with some disappointment but they should all remember that in overall terms this has been a very successful season. I have attached the team photo (thank you Simon) if you were not able to take one yourself. As advised the semi-finals and finals will now be held on Saturday 28th April at Colney Heath School. Referees will be provided for all semi-finals and finals but it would be appreciated if each team could provide a linesman. This years St Albans District Cub Football Finals will take place on the 28th April at Colney Heath School starting at 1.30pm. In the Salway Cup, semi finals, 1st Impeesa will play 2nd St Albans and 1st Impala will play 4th St Albans. Lets support our teams ! Lets also thank our football managers who are stepping down after these finals, Sincere thanks to Philip & Sarah, and Michael & Orla for all their hard work , commitment and passion! 1st Impeesa went into their final league match knowing that if they avoided defeat they would be crowned champions of the cub football league. An unusual start to the game as 2nd won the toss and decided to change ends which is not something I have ever seen in Cub football – was it mind games or wanting to attack the end with the better goalmouth? Both teams started lively and the commitment to win was clear from all the players as tackles were won and lost and both teams began to create chances. The 1st were more dominant in possession with the attacking quartet of James, Ben , Jack and Tom linking up well to create some decent chances. Both James and Ben had shots blocked whilst Tom’s accuracy from the corner led to confusion in the penalty area but no final touch from a white shirt despite Jack’s best efforts. Jack had been lively and when James’s long pass found him in space he out sprinted the last defender to finish clinically in the corner to give the 1st the lead. The 2nd responded and Dylan was called upon to make one excellent diving save and another with his feet. The defensive trio of Ozan, Charlie and Ronan were preventing further attacks. The introduction of Callum and Joshua changed the positions but not the format of the play as Joshua himself was unlucky not to double the lead before the break. The second half was a long 20 minutes especially after the 2nd equalised soon after the restart as the attacker broke clear and scored despite Dylan’s valiant efforts to deny him. The game and the atmosphere could have become more edgy as the 1st knew that they could not afford to concede a 2nd goal. However it is often said that the best form of defence is attack and so it proved as within a couple of minutes Jack’s cross had been turned home superbly by Joshua for a 2-1 lead. Thereafter the game became a bit of a midfield battle with James & Ben putting in some strong challenges to win back the ball. Ben himself had a great run and shot on the left and Tom had 2 or 3 shots blocked by different defenders. The defensive quartet of Sammy, Ozan, Callum and Ronan were put under more pressure but held strong to protect the lead. The pressure from the 1st finally told as another corner from Tom caused chaos and Joshua was able to stab the ball pass the goalkeeper to give the team a 3-1 lead. In the final 10 minutes other chances came and went but ultimately the boys stood strong and refused to give away the lead and the result they had worked so hard for. At the final whistle all the boys were ecstatic and the smile on their faces and their appreciation for each other as team mates was evident for all to see. We also saw sportsmanlike behaviour from everyone on both teams at the end which was great to see. MOM as usual was difficult again as all the team played incredibly well. A special mention to Dylan for his goalkeeping but award went to Joshua whose clinical finishing scored the goals we needed to secure the victory and title. Winning a league title is special at any age and the afternoon of Saturday 3rd February 2017 should live with them all forever. 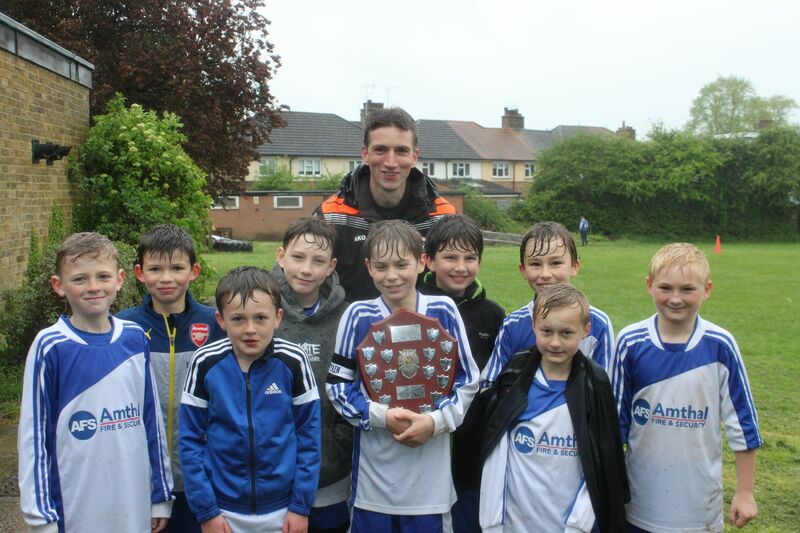 Another wet and dreary afternoon was brighten up again by the players from 1st Impeesa who took another giant stride in their quest to win the Cub football league. The 1st half was a very dominant display although Dylan was called upon to make 2 fine saves with his feet and his hands. We managed to hit the woodwork 4 times in the fiirst half as both Jack (twice) and Joshua hit the post and Jack also saw an excellent shot tipped onto the crossbar as well. In between the woodwork Jack scored an excellent double and James powerfully ran at the heart of the opposition defence to score a 3rd. The defensive trio of Callum, Charlie and Ronan were superb throughout and snuffed out most attacking intent from the opposition. Tom was his his usual industrious self and took a number of excellent corners which with a little more luck would have been converted. The usual flurry of substitutions changed the personnel and formation but not the balance of the game as the 1st continued to create chances and force the goalkeeper into some good saves. We hit the woodwork again as this time James had had a shot rebound from the post and Sammy hit a thunderbolt of a shot which flew inches wide. Joshua scored with a volley from James’ cross for the 4th before 2 further goals from James towards the end of the match completed his personal hat trick and sealed a 6-0 final scoreline. Other notable enjoyable moments include Jack’s back heel attempt on goal from Tom’s cross, Joshua double shot being saved in identical fashion and Ronan (now in goal) producing the one save which he needed too. Ozan was a reliable as ever in the heart of the defence and a couple of forays into the penalty area nearly resulted in another goal. Both Charlie on the right and Sammy on the left were solid and took some good throw ins. Dylan’s perseverance along the left wing deserved much greater reward as his trickery set up a number of good chances for the strikers. So a good all round team victory which sets them up nicely for the final match next weekend. MOM went to Sammy for being a real team player and for keeping to his position and supporting the team with some great defensive tackles in equal measure. An entertaining game full of goals and credit to players from both teams for playing through the elements. This match summary will probably be missing a few incidents due to a combination of factors: my pen stopping working in the rain, my piece of paper getting wet and becoming unreadable and the battery dying on my phone so I couldn’t jot things down on it either. The match saw Callum kindly volunteer to play in goal in the first half and Tom in the 2nd becoming the latest of the 9 players in the squad to have taken a turn in goal this season. The first half was characterised by a blistering 5 goal personal haul for Jack whose finishing was superb and gave the goalkeeper virtually no chance with any efforts. He was supported with some good link up play from Ben and Dylan behind him whilst Ozan and Ronan were solid in defence. After a flurry of substitution further goals followed with Joshua and James getting on the score sheet and Tom being very unlucky with 2 decent efforts which deserved better reward. The goal conceded was well taken by the opposition and gave Callum no chance in goal. It was 7-1 at half time. The second half saw a flurry of more substitutions as we changed personnel and positions. The opposition started the 2nd half with more attacking intent and Tom made 3 excellent saves my personal favourite being a diving save towards the far post. Whilst we conceded 4 goals in total this was certainly not a reflection on his performance as it would have been more without his efforts. In attack Joshua was on the hunt for a hat trick and some good passing between Joshua, Jack and Dylan allowed him to score the 2 goals and his first hat trick for cubs. The introduction of James in the latter stages saw both Jack and Ben go close but some decisive finishing from James himself saw him score 4 goals in the final 8 minutes of the match. An excellent passing move between Ronan, James and Ozan saw Ozan run powerfully into the penalty area and score with a thunderous shot which his performances all season fully deserve. The final whistle was greeted with cheers and lots of muddy kit ! MOM as usual was tricky. A special mention to Jack whose potency in front of goal set us on the right path and both James and Joshua for their goals too. The defence was a solid as it could be in the weather. However MOM went to Tom whose bravery, commitment and athleticism in goal was fantastic to watch!